Tucked in between 96th Street and Lantern Road on the southern edge of Fishers Indiana, this Estridge-built neighborhood offers one of the most convenient-to-everything locations you'll find in Fishers. 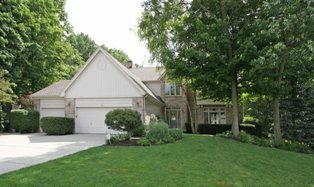 Winding streets, beautiful wooded lots, a neighborhood pool and tennis courts plus quick and easy access to I69, I465 and all shopping makes this 200-home enclave hard to beat. Charm, convenience and affordability (prices range from the $180s to the mid-$300s ) are just a few reasons why these homes typically sell quickly! Almost all Covington Estates homes are 2-story, and many of the homes on wooded lots feature coveted walk-out basements! Students in this popular Fishers Indiana neighborhood are part of the Hamilton Southeastern School District.